"Once upon a time, a few kids with guitars and drums got together and had some fun. But there was something different about this group of kids; a different sound, different ideas, different actions, and girl lead guitar player. This really singled the group out. Anyway, the kids picked a name and called themselves "The INVADERS" and the rest is history..."
Travis Sifford, and Nick Whitlow. 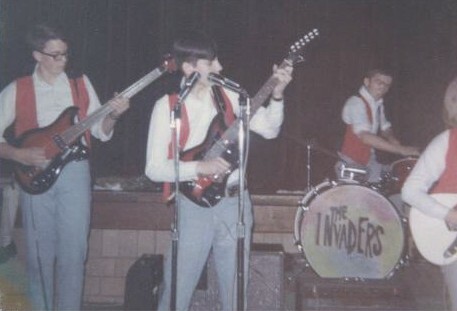 "The INVADERS" were formed like many of the local bands in the 1960's. Cousin's Nick Whitlow and Jim Reese got together and played a few tunes in the basement of the Reese home. Nick played rhythm guitar and sang while Jim played drums on a small trap set. A mutual friend, Lannie Bailleul, also had an interest in music and was into electronics and sound systems. He also had a cousin that played guitar, Mary McKee, who he soon convinced to join the group. Bailleul became the unofficial manager of the group. 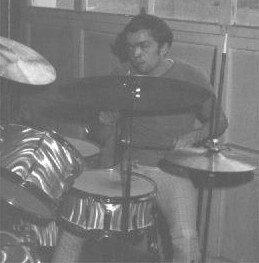 After several practices, Bailleul arranged for the band to perform two instrumental songs for free during a "Victory Dance" in the old gym at Carlinville High School in late 1965. The band that was hired for the night, "The Vibrations" introduced the new group as "The INVADERS." They were set up on the floor in the northwest corner of the gym. The two songs performed were "Pipeline" and "WipeOut." As they played, the crowd closed in around them and cheered loudly after each song. It was a successful preview of things to come. As with many groups, controversy soon arose. Bailleul was bitten by the music bug and purchased his own set of drums, which included two tom-toms, a floor tom-tom, and several cymbals and wanted to form his own group. McKee informed the others that she was going to stay with her cousin. This move forced Whitlow to follow suit, leaving Reese out in the cold. Later he was unsuccessful at getting into another band. 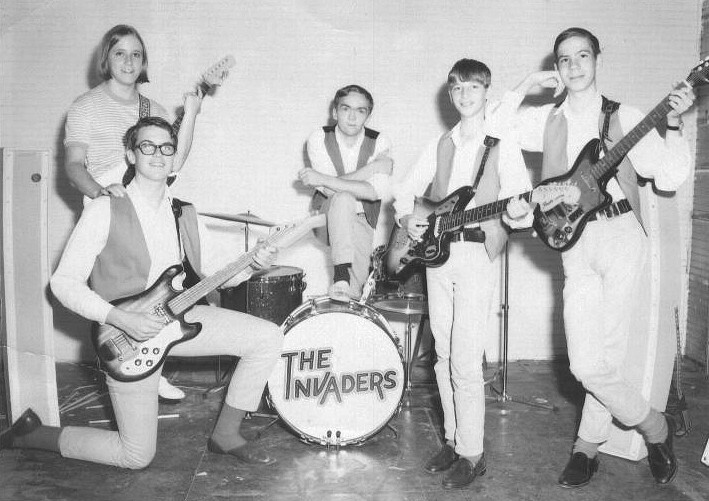 The revised group retained the name "INVADERS" and were soon joined by Nick's friend Jim Forbes, who played bass. After many hours of practice, the band had learned a group of songs that included "Gloria, I'm Not Your Stepping Stone, Paint it Black, WipeOut, 96 Tears" and other hits from that period. Most practices were held at Bailleul's home, but a few were also at the McKee residence. Whitlow lived across the street from Blackburn College in Carlinville, and had many friends there. Forbes' father also worked at the college. Through these connections, the band was able to arrange for a free gig in the Student Center on a Saturday night in early 1967. It was a major coup for the group even though they were playing for free. To help make a good impression, Whitlow's mother sewed each band member a reversable vest for the occasion. They were red on one side and black on the other and were barely finished in time for the show. It was a magical night and the band was well received. Many of the groups parents also attended and it was a proud moment for everyone. Later in the evening, the band was approached by a faculty member about performing in an upcoming "Battle of the Bands" to be held in May in the big gymnasium. The group agreed to participate. A short time later, Bailleul befriended Travis Sifford, who also played guitar. Travis had use of his father's Fender Jaguar guitar and Fender Twin Reverb amp, which was some of the most expensive equipment available at that time. Siffert was young and inexperienced, but Bailleul wanted to include him in the band because of his expensive equipment. This created a conflict between Whitlow and Bailleul. Nick, who was responsible for most of the musical arrangements, was concerned about Sifford's ability and ultimately how the band would sound. Bailleul prevailed, but the conflict would persist. 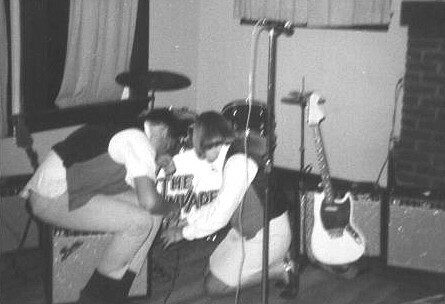 "The INVADERS" made their next public appearance in the "Battle of the Bands" at Blackburn College on May 16, 1967, where they competed against two other local bands, "The Good Things" and "The Fugitives." Despite a great performance and huge support from the crowd, "The Good Things" were declared the winners and received the big $50 prize. After their defeat in the Battle of the Bands, the group started to think about making some money of their own. Besides the few dances that were held at the high school, local bands would sometimes rent a private hall and hold their own dance. The Elks Club, Moose Hall, and Legion Hall were typical venues. The band decided to rent the Legion Hall for their first personal gig. Not only did the band have to cover the cost of the hall, but since they did not own a PA system, that too would have to be rented from the local electronics store, Woods/Paulsen. It was always important to reserve the PA well in advance as several other local bands rented the same equipment. For consistancy and appearance, Whitlow, McKee, and Forbes all purchased new Fender amplifiers. 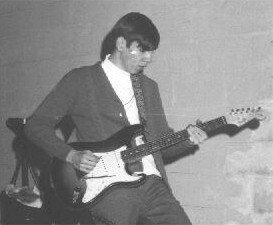 Lead guitarist McKee got a Princeton Reverb, while Whitlow and Forbes bought the regular Princeton. These matched the Fender amp that Sifford had and was an impressive layout. 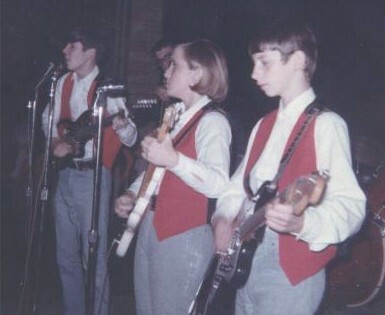 For their next public appearance, the band purchased polka dot shirts to wear under their vests. Mary was beginning to show her feminine side and moved away from the bands standard blue jeans and started wearing skirts to perfomances. 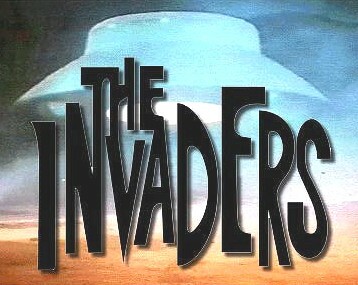 Besides the bands unique sound, "The INVADERS" pioneered some new lighting effects. Bailleul's electronics background helped him create a series of automated lightboxes that changed colors in sequence. This was a totally new concept in Carlinville, and the system was soon imitated by other bands. "The INVADERS" first private dance was a modest success. There was a good attendance and the band had a great time performing. Between the gate receipts and profits from refreshments sold by their parents, there was enough money after expenses to spread around. 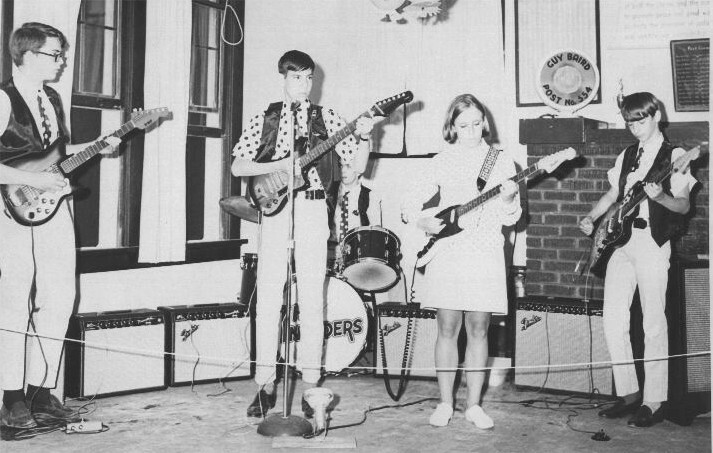 Note the amplifiers and new polka dot shirts worn by the band members. After a few months of practicing, it became obvious that Mary McKee and Jim Forbes were becoming good friends. This eventually blossomed and the two became a couple. Most of the time this was not a problem, but on occasion the couple was not concentrating on the rehearsal and they would often disappear for long periods of time during breaks. In the months that followed, the band would get to play at a Victory Dance in the old gym at Carlinville High School, win a talent contest at a nearby county fair, and rent the Legion Hall again. The second dance was a little more successful this time. The polka dot shirts were not used however. while Mary and Jim look on. Just as things were going well for the band, a major change occurred. Bass guitarist Jim Forbes moved to a different school out of state. Lead guitarist Mary McKee took the loss very hard. Part of the original "soul" of the band was lost with Forbes' departure. Soon a replacement was found. Another young guitarist by the name of Rick Marko joined the group. His parents were very supportive and practices shifted to the Marko residence. One of the few well-paying gigs in Carlinville at that time was the 8th Grade Prom. 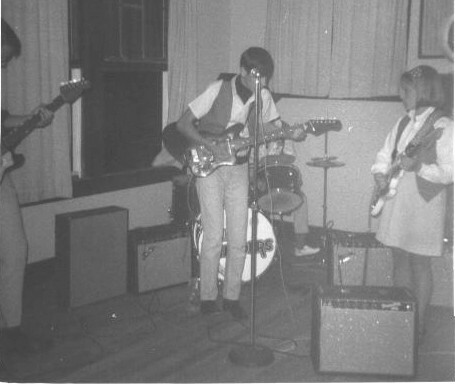 The school always hired local bands instead of professional groups as was the case with Homecoming and the Senior Prom. Bailleul had lobbied hard for the job and was successful in getting the band hired. Then, more bad luck. Weeks before the 8th Grade Prom, lead singer Nick Whitlow came down with Mononucleosis and was sidelined for two months. This was a major blow to the bands visibility and pocketbook. Shortly after losing this gig, Mary McKee would call it quits and leave the band. Soon after, Rick Marko moved on to join a band headed up by Prentis Wild. Evenually Marko's parents built a new home with a huge, soundproofed practice room for Rick's band. 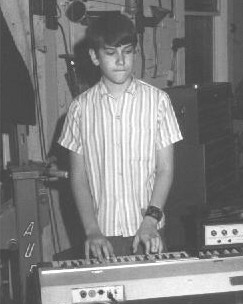 A young keyboard player named John Klimet then joined the band and added a new dimension to the groups sound. Bailleul, Whitlow and Klimet tried to keep "The INVADERS" going, but stiff competition from other local bands was making it hard to get jobs. At one time, they were one of the best sounding bands in Carlinville, but the group had now suffered too many twists of fate. During this same period of time, "The Good Things" had matured into a more polished group, and new comers "The Psychotic Reaction" had exploded to great local popularity. It seemed "The INVADERS" were losing ground. In the later days of "The INVADERS"
his home in Springfield, IL. The last public appearance of "The INVADERS" was at the Porta High School in Petersburg, Illinois. Bailleul had been contacted about playing there for quite a large sum of money and the group couldn't pass it up. Additional musicians were quickly convinced to join the band for this gig. They included former member Rick Marko. This was the "Last Blast" for "The INVADERS." It was a bitter-sweet performance, but everyone had a great time and the band was well received. So ends the story of "The INVADERS" who made a difference in the music scene in that small town of Carlinville, Illinois. Their sound and innovations set a high standard for other groups to follow, and made things better for everyone involved.